MISSION STATEMENT: Elder William Murphy's goal for this CD was to offer a collection of Gospel music, which will inspire people to worship and praise God mightily in song, offering something for everyone's musical preferences. "Don't you ever again stop your worship to sing a song!" Selected text: Elder William Murphy poignantly shares his personal testimony: "The Lord gave me this song a few years ago, and I don't mind telling my story. My mother was 15 years old and my father, (Bishop William Murphy Jr.) was 17 years old when I was born. You know what they call me, don't cha? They call me a mistake. They said I was illegitimate. They said I was the result of their (his parents) sin. How many of you know that God has the power to take your MESS and made it a blessing to the nations?" "The enemy said, 'You are going through this right now, because you really aren't supposed to be here. You are a mistake! God doesn't really have a purpose for your life.'" Psalm 33:1,3 - Sing joyfully to the Lord, you righteous; It is fitting for the upright to praise him. Sing to him a new song, play skillfully and shout for joy." One of the highlights resulting from Elder William Murphy's active use of his musical and spiritual talents was the creating of this album, The William Murphy Project: ALL DAY. This moving collection of songs offers a variety of inspiring, intense, energizing praise, worship, prayer hymns and anthems which encourage the listener to enter into a true state of focusing on the Lord, guaranteed to lift the spirits, encourage the listener to praise and worship the Lord, if not to dance around the room! Traditional and Contemporary Gospel, Urban R& B Gospel, and Gospel blended with elements of Contemporary Christian and acoustic influences can all be found in one album! The first 13 cuts on this CD were originally recorded in a combined meeting of 6 church congregations at Murphy's home church, New Birth Missionary Baptist Church in Atlanta, coming together in this group worship experience, where the choirs from all of the churches participated, as well as about 12 backup singers which stood on the stage behind Elder William Murphy and his fellow performers. I was lucky enough to receive the dvd of this effort as well, which makes one feel like part of the service, fully experiencing the power which flows through the service. Some of the vocals were done over in studio and dubbed over the original vocals because it is hard to get a clear recording in a service, which results in the listener hearing a clear version of the songs. The first cut on this album, begins with an on-fire, declaration of the goodness of our Lord, in GOOD, which pumps the audience and the listener up with its enthusiastic vocals of all concerned, encouraging lyrical message, and driving musical accompaniment, including a cooking bass part. The heart and meat of preparation and the deeper worship and thanksgiving music can be found in cuts 2-8, beginning with a lovely heart-felt choral introit prayer song, HEAR MY PRAYER. These songs and William's commentary all flow beautifully together, providing spiritual meat to those ready to experience more than spiritual milk offered elsewhere. 3rd cut is the encouraging, traditional Gospel anthem, BE STRONG, led poignantly by Elder William Murphy, and is complete with a reprise (4th cut), sung by Elder William Murphy's father, Bishop William Murphy Jr., with Elder William Murphy, providing back up vocals. Powerful dynamics, powerful listening experience. 5th cut is the beautiful, dynamic worship anthem, CREATED TO WORSHIP, a truly moving, dynamic heart-felt Gospel at its best. 6th cut - Elder William Murphy powerfully testifies about his own life, in a mini-sermon, aimed at people who feel inadequate to serve God, especially children of unwed parents, and unwed parents themselves. 7th cut - HEALING WORSHIP - A song of thanksgiving and intro to PRAISE IS WHAT I DO. Another mini-sermon encourages people to turn emotional scars over to the healing power of the Holy Spirit, through worship and praise. 8th cut - PRAISE IS WHAT I DO - One glorious praise anthem which is a great conclusion to this group of songs, which truly inspires the audience at this service as well as this reviewer. 9th-13th cuts are contemporary praise songs and lovely prayer hymns and worship anthems, which would be popular in any contemporary worship service; denominational or non-denominational, not just Gospel music-loving congregations. 9th and 10th cuts are definitely joy and thanksgiving songs. AWESOME is a contemporary praise rock song done Gospel style, which would do well in any contemporary worship service; denominational or non-denominational. Youth and young at heart would fall in love with this song. LET IT RISE is a moving acoustic praise - thanksgiving anthem which not only gives the opportunity to praise God in thanksgiving, but also gets the audience and the listener in the right mind to be open to the following prayer hymns, to sing unto the Lord. 11th cut - ONE PURE AND HOLY PASSION - A lovely, memorable, moving duet sung by Elder William Murphy and Lilly Wilson, which encourages us all to follow after Jesus, walking with Him in love and service. 12th cut is the powerful reprise, done in traditional Gospel style. 13th cut - IGNITE MY FIRE - Another beautiful, dynamic Gospel prayer hymn, the perfect choice to end this service, which encourages the believer to seek the Lord, asking Him to empower, fire up, encourage believers to burn for His glory to be in His will for their lives. The last two urban R & B Gospel cuts on the CD, Title song: ALL DAY, a bright, urban Gospel cut and the acoustic R & B I DON'T KNOW WHY were performed in a studio.Both are delightful additions to this fine album, and a great introduction to folks new to the urban and R & B Gospel format. I DON'T KNOW WHY - A song of confession and of seeking the Lord, after turning away from the Lord. Title song: ALL DAY - A very unique prayer ballad, with a hip hop beat which explores the struggle we all can relate to; Making time to spend with the Lord, to get to know Him, develop our relationship with Him, despite distractions and the busyness we have in our lives. WOW! What a Gospel Music album!!! It delivers a listening experience well worth wrapping one's head around, and absorbing! 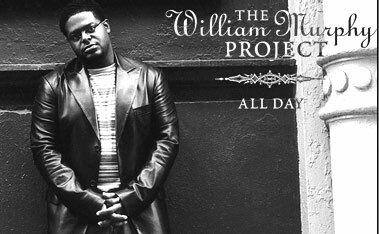 If you are looking for spiritual meat through music which I would describe as dynamic, heart-felt, energized Gospel, The William Murphy Project: ALL DAY would make a stellar contribution to either your personal Christian Music collection or for your church musical library. I'm blessed to have this album in mine as it truly elevates me into a state of praise and worship, despite the pressures and stress of my life! If you want and enjoy a more in depth review, continue on to the songs, vocals and lyrics section. The Holy Spirit was obviously front and center, as an electricity flows through this collection of songs no matter their genre orientation or category. Elder William Murphy is a gifted minister of worship. the best I've heard in a very long time! He strongly feels his calling to encourage and promote a deeper form of praise and worship among people, and depends on the Lord to empower him to do so. It shows on this collection of encouraging and Spirit raising praise and worship songs. It shows in his preaching and leading style: He is willing to share what he has learned on a personal level in order to encourage others about themselves and their abilities. 2) For traditional Gospel enthusiasts, Elder William Murphy, his father, Bishop William Murphy Jr. and Lilly Wilson have done reprisals of some songs performed in this service, sung with feeling and spiritual emotion, which is spiritually elevating, helping to lift us into a deeper praise and worship experience. 3) He can switch from being the lead vocal performer, to a duet, to being backup vocals, and sneaking in leading and teaching, for example ONE PURE AND HOLY PASSION. It shows in his lead vocals, his song writing and their lyrics heard on this collection of encouraging and Spirit raising praise and worship songs. Elder William Murphy also has a wonderful voice and the talent to use it. He has a powerful, rich voice, sings in a variety of styles, fully understands how to use dynamics, in whatever octave he is singing, powered with great breath control and the Holy Spirit. * Contemporary Gospel: IGNITE MY FIRE * LET IT RISE * ONE PURE AND HOLY PASSION; which has a beautiful melody, a lovely duet, poignant lyrics, all of which choke up his reviewer. 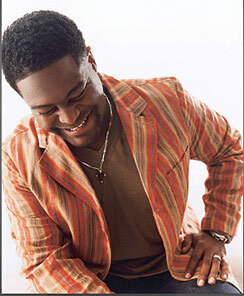 * Urban Gospel & R & B: I DON'T KNOW WHY * ALL DAY; which also has a little rap (clear and understandable!). Lyrics are easy to repeat and remember, yet meaningful and to the point of the message of the song, clearly and effectively presented in song. The melodies are varied, memorable and musically interesting. Harmonies are beautifully done. Musicians in the band were exciting to hear, especially the organist, pianist and bass player! The presentations of the songs are especially effective, performed with umph, poignancy, offering a great variety of stellar dynamics, well-done, heartfelt vocals, sung by talented folks full of the Spirit and a heart for the Lord. I adore Gospel choirs which can not only stay on key, sing their vocal parts (base, tenor alto and soprano) well and faithfully, following the dynamics of the music, but also perform like they truly believe what they are singing. The choral efforts on these songs are truly inspiring to the listener and help to sweep one into the place of praise and worship, pulling the listener up to a higher level into the presence of the Lord. A great favorite of this reviewer; the perfect song to start this wonderful CD! The organ, piano and bass provide a strong, irresistible musical foundation, cooking and sizzling right along. Song is a great ice breaker for the audience, as he asks the audience to turn to each other and say, "I just stopped by Here to tell you / Our God is good." This song does a great job of getting one's mind off worldly concerns and trials by reflecting on what a wonderful Lord we have and giving praise in a dynamic way. A great favorite of this reviewer. A choral introit which is fully expressed by the dynamic full of the spirit choir and fueled musically by accomplished organ and piano players. A 3/4 meter composition with terrific dynamics. Begins softly, prayerfully and builds and swells Organ and piano and full sound of Gospel choir, well representing all the vocal parts (Base, tenor alto, soprano) magnificently carries the feeling and worship quality. Harmonies are modern urban, in spots, adding to the beautiful, full sound. 2nd favorite song of this reviewer on this CD. Glorious piano worship song with wonderful dynamics, great contrasts in the musical composition and the vocals. The music, lead vocals by Elder William Murphy and choral vocals dynamically build into a stirring anthem. The lyrical message is a reminder to all believers that we have a purpose in this world which will glorify the Lord. It is also a personal statement of faith and revelation for Elder William Murphy. Lyrics: "Don't you ever again stop your worship to sing a song!" A great favorite of this reviewer. A very peppy, energetic piano rock dynamic praise song with an infectious melody and irresistible, moving beat which would find a home in just about any contemporary service; denominational or non-denominational. It sure inspires a song of thanksgiving, and a joyous dance around the room. A sure hit with the young and the young at heart! Another song which does a great job of getting one's mind off worldly concerns and trials by reflecting on what a wonderful Lord we have and giving praise in a dynamic way. A strong favorite of this reviewer. A spirited, acoustic-based, bright and peppy, inspiring praise and worship anthem which would find a home just about any service where guitar-based anthems are welcome! Elder William Murphy sings it through once, and then invites the choir to sing the basic lyrics/ musical theme, and the worshippers in the audience as well, during the many repeats of this composition. He leads, sings lead vocal part / preaches a little in song, in between the basic lyrical part and sings as well with the choir. Begins with a simple acoustic guitar and builds in sound to the end. Favorite song of this reviewer. This contemporary, acoustic-based Gospel prayer hymn has everything that a great prayer hymn has in order to make it uplifting to listen to and motivating a deeper prayer life. All in one song, there is a memorable, strong melody, heart-felt, well-written lyrics, terrific dynamics and wonderful lead vocals by Elder Williams Murphy and Ms. Wilson, who sing a duet in parts, as well as lovely choral support from the inspired choir. The arrangement of this hymn by Elder William Murphy is well put together and directed musically. As mentioned above, Elder Murphy is a vocalist who easily switches from lead vocals to singing a duet with Ms. Wilson, to support harmony with the choir as Ms. Wilson takes the lead, while interjecting preaching and leading. The Reprise is the cherry on top, performed in the Gospel music tradition, with Ms. Wilson singing the lead vocals, with Elder William Murphy singing the backup echo, with intensity and feeling. Third favorite song of this reviewer. Wow, what a beautiful, dynamic Gospel prayer hymn! Lovely melody which begins softly and builds into a full harmony sound when choir enters, following the lead vocals, in fine Gospel tradition. Great dynamics, emotional vocal delivery by both the lead vocals by Elder William Murphy and choral voices. Composition has some effective key modulations, which add umph to the growing dynamics of all concerned. The Lyrics are moving and state perfectly our need for the Lord to keep us motivated, strong and on track. This CD ends brightly with Modern urban R & R Gospel, recorded in a studio. 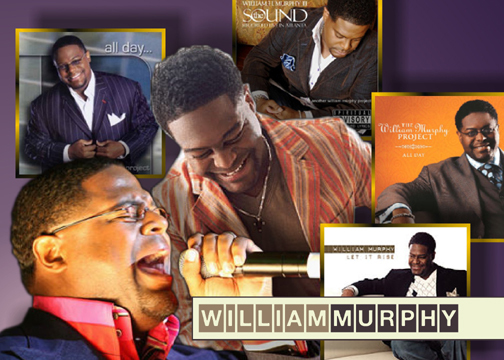 William Murphy's vocal range is showcased in these songs. Vocals are expressive, dynamic, energetic. A great favorite of this reviewer. An example of fine R & B Gospel. This prayer of confession is propelled by an acoustic guitar, an easy R & B beat, and strong rich vocals sung by Elder William Murphy in a vocal style quite different and quite interesting, perfect for this type of song. Lyrical message. William Murphy's vocal range is showcased . Vocals are expressive, dynamic, energetic. Explores the human struggle to stay connected to the Lord and our tendency to stray. A strong favorite of this reviewer. A modern urban Gospel ballad, with a cooking musical and sythns accompaniment, plus a perky hip hop beat which is expressed by guitar, light piano and synths beat. 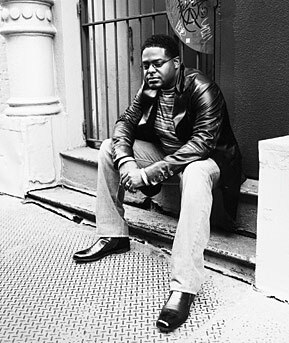 Lead vocals by William Murphy are expressive, dynamic, energetic and carry the melody. Elder William Murphy can also rap with ease, clearly and in the style required!! Lyrical message which explores ways to spend time with the Lord, and how to depend on Him to keep us strong, giving some suggestions on how to stay connected, a great follow-up to the song, I DON'T KNOW WHY. Encourages us all to have time with the Lord by bringing Him along wherever we go, to pray to Him, share our day, thoughts and feelings and ask for His help.